On this day in 1938, Commodore Reginald Peel retired as a commander of the Cunard White Star Line. Captain R.V. 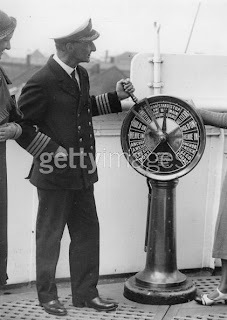 Peel, Commodore of the Cunard White Star fleet, and commander of the Queen Mary, retired from active service yesterday. He succeeded the late Sir Edgar Britten as commodore in November, 1936. Captain Peel, who was born at Rock Ferry, Cheshire, joined the Cunard Company in 1900, and after passing through various grades he was appointed to his first command in 1914. He served in the war, and after demobilisation rejoined the company, and has commanded all their big ships, including the Mauretania, Berengaria, Aquitania, Majestic, and Olympic. The commodore, it will be remembered, made a dramatic dash to take command of the Queen Mary in October, 1936, when Sir Edgar Britten was found unconscious in his cabin. About to start a three weeks' holiday he had to dress, pack, and dash to the liner in a car, and reached her when all was ready to cast off. In the announcement of Captain Peel's retirement, the Cunard White Star Line state that he is "the possessor of a record of service of considerable distinction, and has always enjoyed the complete confidence and esteem of the directors and management. "The company, in expressing their regret to Captain Peel on his passing from the active list, add their high appreciation of his services and their best wishes for many happy and restful years of leisure in his retirement." When he was appointed commodore of the line little more than a year ago Captain Peel said:-"I feel that it is a great honour, especially since I shall follow such a great seaman as Sir Edgar Britten, who was a great skipper and a personal friend of mine." A few days before he had brought the Queen Mary into Southampton after one of the roughest crossings of her career. During that voyage Captain Peel spent as long as 60 hours at a stretch on the bridge. He would not agree that it was the worst storm he had known in the North Atlantic, but he said that he had never known such bad weather to continue for so long. He was full of praise for his ship's performance and handling. The month before, too, the great liner met with heavy weather, and a number of passengers and crew were injured by being thrown about. When he arrived safely at Southampton Captain Peel, commented that the Queen Mary was "absolutely safe." An official of the Cunard White Star Line told a reporter yesterday that Captain Peel's successor as commodore has not yet been appointed. "It does not mean that he will necessarily be the captain of the Queen Mary," he said, "although the last two have been. It is [illegible] the captain of an intermediate vessel will be appointed commodore." 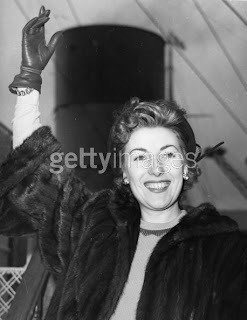 On this day in 1951, British wartime singer, Vera Lynn, known as the 'Forces Sweetheart', was aboard the Queen Mary on her way to America. Also aboard the liner: Winston Churchill. 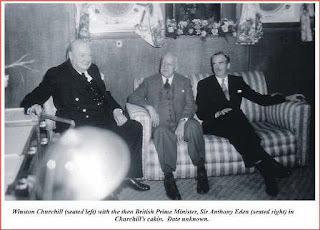 On this day in 1951, Sir Winston Churchill, once again Prime Minister of Great Britain after losing to the opposition party in 1945--apparently the British public did not feel obliged to reward the man for getting them safely through a World War--conducted high-level diplomatic meetings aboard his favorite ship (he was particularly fond of the First Class Drawing Room). Among those taking part in the meetings were American Ambassador, Walter S. Gifford, and British Foreign Minister, Sir Anthony Eden. Churchill would remain Prime Minister until his resignation in 1955.